Just a quick note to tell you that my WONDERFUL husband figured out a way for me to be able to transfer photos from my camera onto a disc, thereby allowing me to be able to instantly share said photos ON LINE! I’m Soooooooo happy! (I had asked for a USB port for my early Christmas present, but then he explained how complicated and expensive it would be, on my custom-made computer…something about buying another Motherboard, then configuring it, THEN adding the USB port, etc. blah, blah, blah…). THIS way is much simpler AND we already have all the needed ‘parts’…Sooooo happy! Also, this enables me to be able to insert photos of the afghan squares people send, or give to me, for my Ghana Project…and not have to wait a month or more before I get the chance to go to the drug store and use their Kodak machine to transfer said photos to disc. If you’re interested-just put two more photos of squares on the Ghana site, under “Contributors”. It’s a gorgeous 70 degrees sunny Fall day here! Time to go out and photograph it!!! Don’t ask me what possessed me, but when I was at the grocery store the other day they had a big box on the floor filled with large cabbages. While in one of the isles I heard one lady asking another “What kind of tomato sauce do you put on stuffed cabbages?” Need to go back a few years, no…make that about 30 years, to the new ‘bride’ (me)…who’s Mother-in-Law just happens to be POLISH. Now “M-i-L” made stuffed cabbages (Galumpki’s) quite frequently and they were good. She suggested ‘new bride’ make them and gave me all the info needed to make them. Do you think I could make them like his Mama? NOT ON YOUR LIFE! “They seem to be missing something…” (Yeah, right !) “They might not have enough hamburger….” (UGH!) “They have too much rice!” (DOUBLE UGH! ), “They need something…more spice, maybe?” (I’ll GIVE you more spice, MISTER!!!) Anyway…’new bride’ had had ENOUGH of trying to please her VERY PICKY husband and hasn’t made them in 29/30 years. WHY, you ask, would I EVER consider making them again? Call it a Senior Moment…call it senility, but I, once again, attempted them last night. As luck would have it, he comes home right while I’m working on them and gives me all the lovely advice I DIDN’T need as to how to cook them: “You’re going to use the pressure cooker, AREN’T YOU?? ?” (No) “Well, maybe you could use the big roasting pan like my MOM did!” (DOUBLE No!) Finally, out of utter frustration I answered said husband: “I’m doing them just like YOUR MOTHER taught me!” (again…WHY am I doing this to suffer this frustration and humiliation???) I made them; the cabbage leaves were totally wrinkly, like none I’ve ever used in the past…they didn’t want to cooperate AT ALL! The ‘rolls’ were blobs – bits and pieces of steamed leaves crammed together into something that resembled a crowd of people at a stadium…definitely NOT uniform! I made the sauce as I remember Mom making it, poured it over and baked them. Sitting down to dinner I was really hyper-anxious, but ignored all expected comments to the negative. Amazingly….HE LIKED THEM! HE RAVED OVER THEM! HE ‘OOOOOOO’D AND AHHHHHHHHH’D OVER THEM! “Very tasty, Pammie!” he said! You could have knocked me over with a pin! It’s a good thing he liked them, ’cause there’s still a good 2 nights dinners left of them in the fridge! Don’t think I mentioned in my last entry that I’ve added more photos to the “Contributors” section of the Ghana Project…entries with photos of some of the squares others have donated (and some finished afghans, as well). Also…I’ve finally ‘gone out of my comfort zone’ and started a knitting group in my area! If you know me, you know I’m a great follower, but NOT a great leader! (I’ve learned my strengths and weaknesses through the years, and leading is not my norm). For about a month now I’ve attempted to find out if there were any knitting groups that met at a place or time I could attend, and there weren’t. Finally, after mentioning this on another knitting site (MichiganKnit), another member graciously offered to help me through the process of starting a group using the site: Meetup.com; now we’re listed under “Waterford Area Knitters” meet up. The first meeting is next Tuesday night, 7-9 p.m. at Panera Bread which is about 5 minutes from my house. So far, I’ve received three emails from people stating they’d love to come…YAY!!! I got to thinking about what things I would like in a group-evenings, during the week, a ‘safe’ place with well lighted parking lot, close to home, AND a chance to get a coffee or something to eat while knitting and chatting…Panera Bread seemed to fit the bill. I’m sincerely hoping that our presence there does not cause the establishment any difficulties (it was advised by the friend who helped me organize this event that I should NOT ask the management ahead of time…less chance of them saying NO, since this IS a public establishment.) Somehow I’ve been feeling like this year has been (and is) a year of change for me…a ‘stepping out’ so to speak, from my more timid self into a person more willing to take chances and try to go forward in my development. I am scheduled to be the Keynote speaker at our church’s Ladies Fellowship for the December Ladies Dinner…that thought terrifies me, and yet I heard myself saying: “Yes, if you want me, I’ll give it a try!” That certainly wasn’t my ‘old’ self talking…but the ‘new/bolder version’ is willing to try…and this will be in front of something like 100 women (it’s our largest gathering of the year…gulp!). I’ve prayed on this and asked the Lord to give me the strength to speak in truth and not to cry…when I speak in front of a group about the Lord, I cry…don’t know why, I just do. This will be giving my testimony of what the Lord’s done in my life from my childhood to the present, and I’ve been given 30 minutes to speak…we’ll see how that goes. So here before you is the new “improved” Pammie…bold in her outlook, and knees shaking, but willing to ‘give it a try’! That’s all the happenings to my day, thus far, now I’m going to go enjoy a much-needed ‘sit down’ in my favorite recliner and commence my favorite passtime: knitting afghan squares for the Ghana Project! Today is the first day of returning to some form of sanity after spending the past four days engulfed in our annual mega garage sale for my special needs group. With outstanding efforts by my two compatriots and myself, plus side help from a few others, we managed to survive ,unscathed, from the ordeal. Don’t get me wrong – I love garage sales but each year as the dates approach for this colossal sale my joints start to ache at the thought of going through mountains of boxes, unpacking loads of various dishes & glasswares, huge piles of clothes, shoes, etc…it is a bit disheartening. The three of us have made an agreement this year that this was THE LAST garage sale, after many in years past. Why, you might ask? Because first, we just don’t have the help we’ve had before, the three of us are all in our ’50’s (with me closely hedging 60) and we’re just ‘plum wore out!’ We’ve decided that next year we’re going to have to come up with another form of fund raiser for our group, with various suggestions being a spaghetti dinner, or some sort of food-related activity. Our group consists of approximately 45 special needs adults, some of who come from group homes. Our parents are getting up in their years (70’s+) and also do not have the energy/stamina to help out in these events, so after all of our efforts, we sadly say “Adieu” to the mega garage sale. Our totals for Day 1 of this event were somewhere in the area of $500, and I’m sure Day 2 did not bring in that large an amount ( we reduced clothing to 25 cents an item). I’m guessing that our totals will be somewhere around $650; all proceeds will go into the General Fund to pay for things like our paper products, plastic wear, pop and snacks, birthday cakes, printing ink & paper for our newsletter, etc. It was a well-spent four days and I gave it my best efforts. Today begins “Digging Out the House!” I noticed (who could miss it!?) that during the four days I was ‘in absentia’, the total condition of my abode deteriorated to almost “Health Department Quarentine”! Just finished cleaning out the microwave (numerous spills ‘baked’ on, splatters untold, etc. ), ‘finding’ the top of the diningroom table under piles of papers, a belt, a pair of socks (remember I live with all guys) and other unusual objects that have no reason to ‘be’ where they were found! The sink is overflowing with dirty dishes, as well as the laundry basket & surrounding floor….oh, this will be a busy day for one Mom…ME! Did I mention that I also need to go grocery shopping as the cupboards are pretty bare? (Just call me “Old Mother Hubbard” for the time being…). It’s going to be a very busy day around here (perhaps spilling into tomorrow, I foretell) just trying to return my house to some semblance of the order I left it in four days ago. I can’t fault my dear husband, though…he called me at the garage sale yesterday while he was at work to ask me approximately when did I think I would be coming home (answer: “Hopefully somewhere around 6/6:30 p.m.) to whit he replied: “Would a Shield’s pizza be in order?” (I need to insert here that Shield’s pizza is at the pinnacle of my favorite pizzas-expensive but ohhh so tasty!) When I dragged my very tired body home at 6:30 there was awaiting my taste buds TWO Shield’s pizzas (one Meat Lover’s and one Veggie…for me), a large Greek salad AND bread sticks with dipping sauce! WOW…he did GOOD!!! (I, of course, showered him with numerous compliments and gratitude for his thoughtfulness). He said: “I’ve seen the work you put into the garage sale and thought you might need a little something ‘special’ to help make your day”….WHAT A SWEETIE!!! (there was enough leftovers for dinner tonight, as well!!!). Well, friends, that’s ‘the way it was AND the way it’s going to be’ for awhile…I survived! Tuesday of this week found me very busily entrenched in the new fall schedule of school, babysitting, and keeping up with life in general. Both of our boys started school on this day, one returning to tech. school to complete his Business, Marketing and Management 2-yr. class, and our youngest to set off on a totally new course: Public School. Since I’ve homeschooled for the past 14 years, this was all new to both of us. Today is Day 3 of Public School and he’s slowly getting used to it all-“LOTS of kids”, “Can’t figure out how to use the locks on the lockers”, “I think Algebra is my favorite subject”…those kinds of things. After picking him up from the first day of school we returned home to find a truck in our drive and our dear friends “Momma & Jay” here to visit. They brought gifts, as is their wonderful habit: homemade jams & jellies in flavors like blueberry jam, plum jam, strawberry-rhubarb, and then something new: Apple-Rhubarb chutney, and Tomato Jelly! I must say, the last two are new to me, but will, I’m SURE, be consumed with great delight by the entire family. It’s wonderful to have such great friends who delight in pleasing others (and they live to make these gifts to give to friends, family, and even new acquaintances!). Along with their food gifts, “Momma” brought a beautiful crocheted afghan done in shades of white, pink, and grey to be included in the Ghana Project shipment. Did I also mention 38 more crocheted squares for said project? 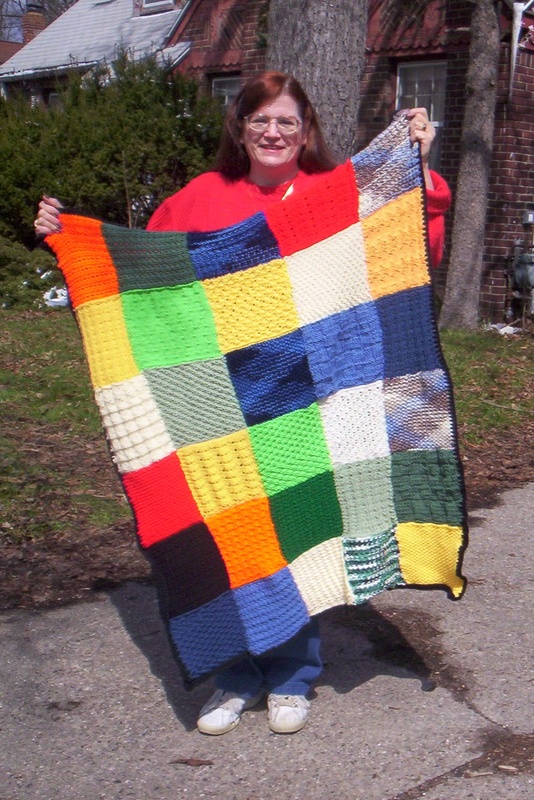 This woman has made and donated more squares for this project than anyone (maybe even me!) and there aren’t words to say how much I appreciate her. We’ve been friends for something like 37 years now and she’s one of the most generous people I know; giving of her talents, as well as her wisdom and friendship…THANKS, “Momma”! (I will include a photo of the 2 of us looking at some of her squares as soon as I get it processed). Here are “Momma” and I admiring some of the squares she brought. Here are the 38 squares and completed afghan! OH! I’ve decided what I want for Christmas! (I know…not everyone thinks of that this early in the year but…it beats my ‘usual’ request for slippers!) I’m a relatively simple person who doesn’t have a lot of wants & needs, so my standard answer of ‘slippers’ is usually about the only thing I can come up with when asked: “Mom, what do you want for Christmas this year?” (I digress…sorry) What do I want this year, you ask? I’ve decided that it needs to be something USEFUL, hence I’m asking for a connectible USB port for my computer so that I can download photos straight from my camera to be put on-line! My computer was custom built by a computer company (used to be my husband’s ‘old’ computer and then I inherited it). When I purchased the digital camera now being used, it was to that end: to be able to download photos to the internet! Not so…no USB port, so I currently have to take the memory card from the camera to the local drugstore and then use their cute little yellow Kodak machine to make a photo disc so that I can insert said disc into the computer and then download said photos to whatever place I need them…time consuming, frustrating, and not practical (if anything…I’m practical!). The cost of the discs is not a problem ($2.99) but I don’t always want to trudge to the store to download 4-5 photos, just because I want them put on my web sites right that minute! Due to this, I end up making notes all over my blogs saying: “Will add the photo to this as soon as possible”… frustrating! The past few days have been filled with driving to and from school, unexpected (but very welcome) company, putting together afghan #11, preparing the lesson for my special needs group (I taught Weds….I’m not usually the teacher), and getting ready for our annual garage sale to benefit the special needs group (that’s coming next week…lots of work, but fun). That’s what’s going on around here these days…busy, but rewarding days. Today is a glorious, sunny day and my last day of ‘freedom from summer’s relaxation’, but I’m OK with that. 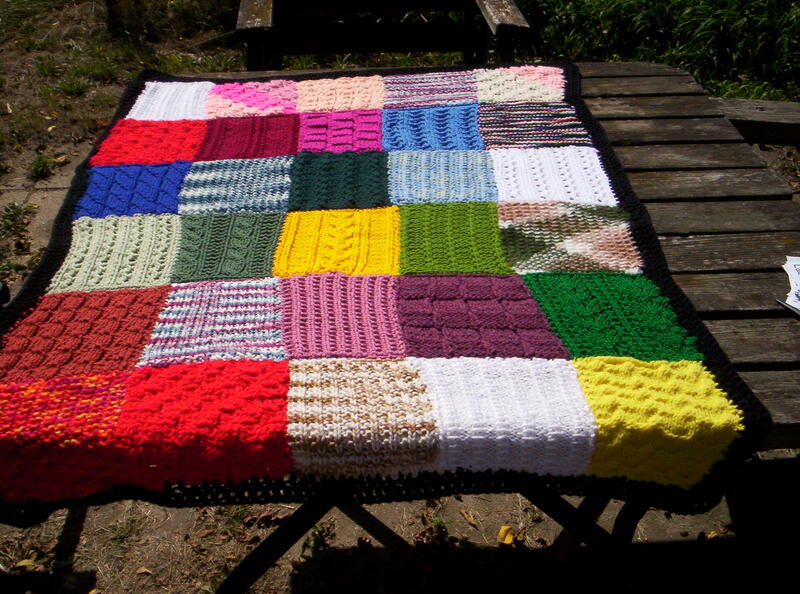 Yesterday a friend from my Sunday school class gifted “The Ghana Project” with 28 knitted squares and 5 crocheted afghans from her granddaughter-it seems the “Project” is gaining momentum; I’m thrilled! Today will be spent relaxing with knitting (perhaps while sitting out in the sun) and totally enjoying my last moments before the struggles and hectic beginnings of school for both of my boys; one is going back to tech. school (very early mornings) and the other is embarking upon a totally new road: Public school/8th grade. I envision tomorrow morning as one of harried rushings and last minute decisions. I’ll be eager to hear his first comments on what he thought of the school, kids, teachers, subjects and all that will now encompass his days. (a brief interjection here) I’m sure that both of his older brothers will be a bit envious as I never allowed them to go to public school, but then, I wasn’t going on 60 while they were being homeschooled and suffering from ‘total brain meltdown’, either! I will continue to report how this ‘public school experiment’ is going.